Honestly I think that when talking about procrastination and homeschooling it has a bit to do with just getting used to a more formal schedule. And getting used to mom as your teacher. And figuring out that there are assignments that you actually do need to accomplish. Sometimes students think that homeschooling will be all fun and games, with easy daily workloads, and totally optional assignment lists. At least that’s what my kids first thought. There are however occasions where students are procrastinating because they’re truly overwhelmed by their workload. Or it might even be a specific subject that causes them anxiety and so they dawdle in order to avoid it. Sometimes it’s just a poor curriculum fit and changing to something that they can relate to better fixes the issue. In the case of a struggling student, make sure to take a look at their load, or at the subject they’re struggling with and see what changes you can make. Or find a way to help them understand it better. For my kids it’s usually not that they’re struggling, but it was more of an adjustment to homeschooling. Even though they have never been in a traditional school, it still took at least a good year for each of them, meaning kindergarten, to fully understand that they did have work that I expected them to complete each day. It was like we had to teach them that school wasn’t optional just because we were doing it at home. Now we complete our school most days without too much dawdling. Mainly because my children know that they’re free once their assignments for the day are done. That puts them in charge of when they’re out of school, rather than me. Which is nice. And has been motivating to my kids for the most part. How to put an end to procrastination in your homeschool. My daughters are really good at sitting down and getting through their work. My son on the other hand is a natural procrastinator. He gets it from his father. Who also likes to wait until the last second to complete his work. And like his father he can be focused when he wants to. Which means he can sharpen pencils for the first half of the day, then bust out his workload in the last 20 minutes easily. So often I’ll find him messing around and doing everything but school. Then rushing to get it done right before I start letting him know his teacher is leaving work for the day. This is bad on a few levels. One, we might be waiting for him to complete his work in order for us to move on to a group activity. And two, I don’t want him rushing through his work. I’d like him to focus and actually learn something. One thing that has helped him out has been setting a timer for each of his assignments. I often use my phone and give him a reasonable amount of time to do each subject. I will tell him how long he has to complete his assignment, then set the timer. If he’s messing around and doesn’t finish, then we put it aside and he can do it for homework in the afternoon when everyone else is playing outside after school. The first time I tried timing him we just continued adding his unfinished work in a pile for homework until his day was done. After dinner he had to finish his work just like regular homework. I do not stay in the room with them after school hours, so my kids have to do homework on their own. Mom’s school hours are 8-3ish. They can come ask a question if they need to, but mainly it’s a consequence for messing around during class. So they don’t get to work with me in there with them. I like to get out of school at a reasonable time too! Some other ideas to help kids focus on their work would be to give them some headphones. If you have more than one child working, it can be distracting for them to try and pay attention to something. I’ve found that a good set of headphones to block out the noise can be quite effective in helping them focus. Another idea is to put up a divider between your students. Since we have one giant desk that we work from, it’s easy for them to chit-chat and distract one another. Most craft stores sell those foldable cardboard presentation boards, which can work well as a divider to give your student a little more privacy to get their work done. And finally, if all else fails, I will sometimes let the procrastinating student go sit in another room to do their work. Our birds can get loud, and so can the other kiddos, so if someone is having a hard time focusing or getting work done, they can move to the kitchen, or dining room as long as they actually work in there. This isn’t my first choice though because often the procrastinator can’t be seen from the other room and so they might choose to take advantage of their alone time by messing around even further. What if they’re working diligently, but just taking a long time? With that said, it’s different if someone is working diligently, but just having a hard time with their work. In that case they get more time, and I’ll help them with it until we’re done then they can move on. Or sometimes we’ll set it aside and move on to other things. Then we’ll come back after school together and work through any troubles they might have had when everyone else is gone from the room. Sometimes a bit of focused one-on-one quite time really helps to help students comprehend the material. However if the dawdling is occurring because they’re just procrastinating and wasting time, then they can have the consequence of doing homework. My children are well aware that homework is a benefit and a privilege to homeschooling. If my children choose to get their work done during the scheduled day, then they’re free to play when they’re done. Teaching diligence and respect for others. My main goal in stopping procrastination in our homeschool was because I wanted to impress upon my children that procrastinating is wasting not only their time, but mine as well. And if we were all waiting for one person to finish something to move on to a group activity, then they’re wasting everyone else’s time too. Part of teaching students how to be diligent with their work includes respecting others time as well. Not only that, but it’s such a nice feeling to get done with your work first, so that you can then have free time. The timer method helps motivate them to do their work, and allows me stop worrying about how long their taking. It puts the ball in their court. They get to decide whether or not they want to have homework. And it frees the rest of us up to move on to our other subjects as a group without making everyone wait for one person to finish. I do want to make it clear that my son was doing fine with the workload and could handle the material easily. And I wouldn’t time a student who was struggling with the workload or tasks assigned. But I knew he could handle what was given to him and he is always given an appropriate amount of time to complete his work. And I will tell you that my son only procrastinated with his work twice before he figured out that he didn’t like doing school in the afternoons/evenings when everyone else is having fun. Plus he has hockey at night and doesn’t want to miss that because he is stuck home doing homework. So now he usually gets things done in a timely manner, and though I do have to refocus his efforts here and there, he’s quite a bit better on the diligence front. I don’t even use the timer anymore either. I really only bust it out if we’re having a day when people are messing around, or if I feel like dawdling is becoming a habit for one of them again. I hope this post helped encourage some of you struggling with procrastination in your homeschool. Looking for more in-depth help on getting started homeschooling? 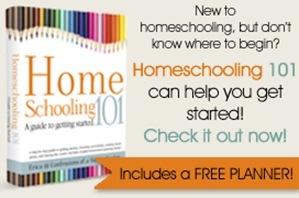 Check out my new Homeschooling 101 book! It’s a step by step guide to getting started, choosing curriculum, deciding what to teach, creating lesson plans, staying the course, and more! Kindle Edition or Paperback available on Amazon.com. 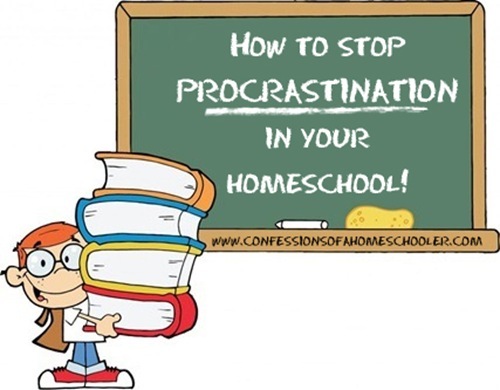 How do you combat procrastination in your homeschool? Leave a comment below! First thank you for this website! It was an accidental find for me while looking up cirriculumn materials. Thank you so much. Next we stop procrastination by having 2 goal poster boards up. One is a weekly /daily completeion task chart where they place stickers when they finish a chapter/test/etc. The other is one I do by placing a check mark on a weekly goals. When the weekly goals are met and they are keeping up with their chart then they win a field trip their choice every third Friday. But you can do whatever works for you. We keep a jar of pre approved field trip choices which we make at the end of each summer. It is fun to make it and the kids get creative and artistic making it. For example our jar has a trip to the imax movie to watch a nature imax, a bowling alley trip to practice math and P.e. skills, a trip to aquarium, a trip to art museum, a trip to a certain park, and art day where we do finger paint and all kinds of art stuff, etc. But you can tailor to your family. These kinds of rewards are really fun for the kids to work towards and keeps them motivated. Sometimes when they need extra motivation we leave the house to do our school work or take a day off to just play. But we’ve been homeschooling 4 years at this point and my kids are 5th and 6th grade. But this works well for us. It keeps me motivated too. Thank your for this insight and great tips! Enjoyed reading this. I have a procrastinator as well. My eight year old always finds reasons to make it take twice as long…. he needs water..he has to go to the bathroom (a million times), he needs his pencil sharpened, you name it and I have probably heard the excuse. This year is just starting off but it’s been a little easier. However, now I am running into him leaving his work to come into the area where I’m schooling his kindergarten brother..trying to be the “teacher” instead of doing his work. Yet another obstacle to overcome this year. One things for sure…homeschooling isn’t boring. I’m a grandmother who is home schooling my 9 year old granddaughter. She doesn’t live with me either. This is the beginning of our 3rd year. Erica, God bless you for all your help and advice. I can’t tell you how much this grandmother appreciates it. My granddaughter has some difficulty with health issues which makes it very difficult for her to focus. She also has a confidence problem as well. She looks at something. It seems hard to her and she doesn’t think she can do it. So, she tends to take a long time to get whatever it is done. I try to build her confidence. She went to public school up until the end of first grade. Public school caused my granddaughter so much harm. I don’t know it she will ever get over it. It caused her to have horrible emotional issues. She stuttered horribly because of it and the teacher told her she was being distracting to the rest of the class. Why would a teacher tell a child something like that even if she was distracting. That is cruel. To make a long story a little shorter I asked my daughter and son in law if they would allow me to home school my granddaughter. They loved that idea. She has grown and learned so much. I would love advice on building confidence. I think that is the major reason why my granddaughter tries to put things off or not want to do something. She simply doesn’t think she can do it. I know she can. I use lots of stickers (which she loves) but I need something more than an award certificate or stickers. Any ideas. Emma is a wonderful and very sweet child. She is very well behaved so I don’t have any problems there. It’s just her confidence I think. Thanks for any advice. If she has confidence with all subjects, I would reward her at the end of the unit/chapter/week with a field trip. If she is having confidence issues with a certain subject like reading, when my son gets frustrated with harder reading, I let him choose an easier book during his alone reading time. He doesn’t have to struggle with the words and it builds him up that he doesn’t need my help to read a book. When we start the next day, he has confidence to go a little longer. Hope that helps. I’m a natural procrastinator as well, I get it from my mom. Funny thing is, procrastination in my middle school students used to drive me crazy. The timer did wonders for lighting a fire under their behinds and getting them to finish something. We’ve only just started our homeschooling journey and I can tell my son is definitely going to be a procrastinator. Yes, this does help! I am going to implement this tip to our homeschool. Thanks so much! Thanks for the article. I’ve found that since we heavily use the computer to research, watch videos, complete online classes, etc I’m having to help combat internet time wasters. I have four children, plus myself using two computers, so we have to be aware of the time out of respect for others. For example, one child goes to submit fan fiction, forgets what shes doing, starts watching figure skating videos, never gets back to her story, but an hour or more has passed. My kids will often set timers for themselves to self-monitor. A long while back, I read about a homeschool mom who keeps a chart of age-appropriate extra chores that need to be done around the house. Now that her children are teens, the chart includes things like mowing the lawn, cleaning the gutters, edging the walk, washing walls, polishing silver, washing the car, cleaning the garage, etc. If they are not doing school work, they are expected to select a chore and complete it. While most of the time, they get paid for completing some of these chores, if they are done instead of school work, there is no compensation. They have a choice to do the school work or chores. Usually they chose school work, because when it is done, they have free time. After the chores are done, they still have school work to do.